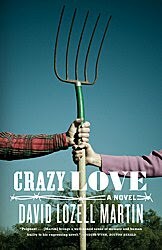 If you decide to pick up David Lozell Martin 's Crazy Love , you're in for a unique experience whether or not you end up enjoying the book. With the style, think Kent Haruf on crack and prepare for an emotional, shocking, heart-warming, yet disturbing story that is bound to stick around in your mind for a little while. Crazy Love tells us a story about two unlikely characters living in the midst of Appalachia farm country who come together in the oddest way. We meet Joseph "Bear" Long, a 32-year old farmer who has never known the touch of a woman and is thought by most to be mentally retarded with the gift of having conversations with animals. Katherine Renault is a classy career-woman and animal-rights activist temporarily staying in town to recover from a traumatic illness. When Bear and Katie meet, their love for animals triggers their love for each other and us readers are prepared for a happily-ever-after ending. This really couldn't be farther from the truth! Although Crazy Love does have a positive ending in a round-about way, it's not at all what you'll expect. The story is remarkably original and very intense in some parts, and the violence and drama will cause your jaw to drop in shock! The beauty of Crazy Love is that although you may not love this book, it will make you curious enough to want to look more into David Lozell Martin 's other work. From an educational standpoint, I find all the sidebar knowledge on the treatment of animals and animal rights to be very interesting, and it is inarguably easy to be drawn into this novel. However, the last fourth portion of Crazy Love is very rushed and thrown together, and could have been more impacting had a softer approach been taken with the characters we come to know so intimately. David Lozell Martin is well-known for his bestselling novels The Crying Heart Tattoo (1982) and Lie to Me (1990), and since releasing Crazy Love has written Facing Rushmore (2005), and Our American King (2007).